The Healing is Always Christ: July 4, 2018: The Wounded Soldier & Sean Winn's Patriot Features/Roy Shenkel & Remembrances of The Giving Helpers God Made and Has Called PLUS MORE! July 4, 2018: The Wounded Soldier & Sean Winn's Patriot Features/Roy Shenkel & Remembrances of The Giving Helpers God Made and Has Called PLUS MORE! See toward the end of today's posting The Lord's Prayer, and the 23rd Psalm- The Lord is My Shepherd. Then see a Salvation Prayer that you may read and promise God in that from your heart or in your own words that you want Jesus Christ to be with you everyday until you go to Heaven to be with Him forever and your beloved! If you are fully, already committed, you might refresh or pass on to someone. If you know you are not saved or even were and backed away, the please COME now and re-commit to God! You will never, ever regret it, but if you are not saved, all of your chance will have gone by the wayside- the Holy Spirit having worked diligently to draw you to Himself for repentance- then your fate will be sealed the other way, to a place- alone and ugly, even tormenting. PLEASE, FRIEND, I am weeping just thinking about this plight for you. PLEASE, Today is the Day of Salvation! 2For He says: “In an acceptable time I have heard you, And in the day of salvation I have helped you.” Behold, now is the accepted time; behold, now is the day of salvation. 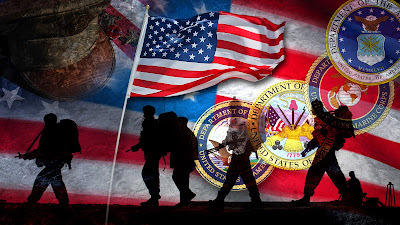 We pay honor, respect, and homage to our military (and those around the world)~ fighting for the good, only!~ which includes the first responders to :emergencies and human beings who are in need, are the police, the nurses and doctors, the fire fighters, and the emergency medical services. Praise God for all of these people [>>>(See below. Florence Nightingales, if you will)] of the nation and the globe. They put themselves in great jeopardy- including the awful heartache and deep sadness, even anger that can linger on in nightmares, daily living, and deep within these people's souls and hearts and minds. Let us pray for them, remember them, pat them on the back and whatever the LORD brings to mind to say, "I love you, and I care!" To say, "I remember you and your families and know just a little piece of what you have given and are giving for others' comfort and very lives." I want to tip my hat (how about a big hug, warm dinner, bouquet of flowers), so to speak, to the amazing and boundless work (thankYou, oh, Holy Spirit!!) that intelligence folks do in America, land of the free and home of the brave, to keep our lands and waters safe from terrorists- of any nature- within or without! Please be thankful to God with me for these heroes, miracle-making people, with God Almighty's Help, who keep our nation, as well as countless others, from the tyranny, oppression, outright evil and demonic plan that Satan would relish we have- but we only "deal" with that until Christ's Return!! (If you madam or sir, are a repented and saved true believer in Chrirst Jesus, then you are NEVER going to be possessed by a devil. You can be oppressed by him or his minions, but you can say in all confidence (exactly like Jesus told him in the wilderness): "Get thee hence, Satan!" "In the Name of the LORD and Savior Jesus Christ, I am His son/daughter, and He is my authority, not you! Leave!" Get thee hence means, "under my foot!" And the devil MUST leave! …4The serpent said to the woman, "You surely will not die! 5"For God knows that in the day you eat from it your eyes will be opened, and you will be like God, knowing good and evil." 6When the woman saw that the tree was good for food, and that it was a delight to the eyes, and that the tree was desirable to make one wise, she took from its fruit and ate; and she gave also to her husband with her, and he ate. Instead of believing God's actual Words to them: that they, Adam and Eve, would surely die if they ate of the Tree of Knowledge of Good and Evil, Adam and Eve believed the serpent, Satan. "We were already like God- He made us in His image (never, are we God! Blasphemy!). Eve and Adam believed the devil's lie that God was trying to keep something from us...why would God, our most loving Parent in the universe He created, want to keep any good thing from us? Never! The Lord wanted/wants to keep us from seeing and experiencing evil and horror. Oh, how I personally wish we did not know the hideous nature of this current world! This following poem, The Wounded Soldier, was shared in The Healing is Always Christ another time. This special time of year in the United States spurred me on to celebrate soldiers and helpers, yet once again. I have included a few others which may be apropos as we prayerfully think of, pray, and give to God's Helpers. Give these warriors/even yourself!~ a big hug~ or tell someone to hug you if you are a helper :) This includes being a prayer warrior! God bless you richly in the grace of our Savior, Christ Jesus~! I am so happy now. Others of us recognize that we are in the presence of An Unselfish Heart, a True Giving Person, which leads me to my family...my mother was the very essence of a giving and loving person, in Jesus Christ. My sister Sherry McCoy and I were born of an exceptional Christian woman for our dearest mother, Dorothy E. McCoy, of whom I have written several times in this blog. Our dad, whom we are extremely proud and thankful for serving our nation and the world, Clayton W. McCoy, served in World War II in all three theatres- the European, the Pacific, and the North-African. He was at Normandy on D-Day, and the next day or so after, he and others of the Navy and armed forces of America went on water and land to retrieve the injured and to take back the bodies of their slain fellow brothers. Yes, that incomparable war and all of them of the world involve The Fight- Good against Evil. These continue today, horribly and unfortunately! These heinous battles, including the deprivation of the citizenry being tortured, raped, and taken captive will abruptly stop when Christ returns for His 1,000 Year Reign! Praise our God Jehovah- Father, Son, and Holy Spirit!! Then, after the 1,000 years, there will be one, very short war where God Himself lays the devil out helpless, defeated-where he belongs for the good of humanity- in Hell Eternally, and he or his demons will never bother or hurt anyone again. God's children made in His Own Image, beautiful animals, gardens and forests, our earth will be lush and free as only Adam and Eve knew for a while. We will have it all forever. I truly imagine that Eve and Adam will be there with us, also. Everyone, give your heart and being, your lives to God Almighty!! See the +++Salvation Prayer+++ and ~~~The Lord's Prayer~~~ and +++Psalm 23, The Lord is My Shepherd (below). The Wounded Healer above all, Jesus Christ, gave His absolute all for each of us that day on the cross at Calgary. His shed blood from His Holiness, both God and Man, Jesus Christ was the only Perfect Lamb capable of cleansing all of the sin that had been, is, and ever would be. He has fought for others. It was, all these years. Who will help him now? Loving and sacrificing for them. Have been ‘round about you. And you did not, many times. My Almighty wings, and rest in Me. Your days with your family. And learn even more about Me. That land you love so well! I put that in you before you were born. I need to find my refuge in You, Lord. Like a Soldier of the Lord (Himself), Jesus Christ of Nazareth, the Messiah, the Saver of our Souls for eternity...He lay down His life for each of us. Lord Jesus, I confess that You are Lord! I believe that God the Father raised You from the dead. I open my heart to You. I lay my life down to You. I invite You to come in as my Lord and Savior. Forgive me of my sins. Give me a gift of eternal life. I have lay my life down for You, Lord God. Live in my heart forever. In Jesus' Name, Amen. And now, the Holy Spirit of God, has come into your heart to live inside you as Helper, for Guidance, and Comfort. Listen to Him. Stay in The Holy Bible, the Word of God, and begin and stay with a very excellent church where Jesus Christ is the Son of God and the Scripture, the Bible, is used and followed. Find a small fellowship within the church where you can be yourself, stay accountable, learn and grow, and help others within and in the community and world. God bless you on the best Decision you will ever make!! I am praying for you! Thank you for your prayers for others. I am very thankful to God for this humble blog. I so very much appreciate you. I am very, very happy for you, Friend of God! By our Lord and Savior. And He loves you so very much! The depth of His continuing love for you. Will be with you again, in the blink of an eye! We can do all things through Christ, which strengthens us. In love and blessings, His mercy is unending. I apologize to whomever did this photo; I love it and was immediately drawn to it for selection of today's sharing. I look back now, and I cannot find the source. God bless the people who worked upon it and all of the wonderful photographers, reporters, and Truth-tellers! of governments!! Coming up! The Lord has magnificently given, now 10 days (update, had moved from 1- 4 at this time by then- November 2015- I wrote on a few other times of supremely high page views from Israel, His chosen people! It all began with my praying and asking God. I will get the link for you in the next few days, so sorry. Also, Sue Barron's dream from God~~~and coming up: Darlene Harrel's prayerful healing and my second major healing through Christian prayer to our Lord; Patty Fransen's dreams about her husband who is in Heaven; and our lady, love her, too! Linda Winn, Bible teacher, who is wife to our main pastor, who has seen her mother in dream/s since she passed on not too long ago! More Names of God in English and Hebrew! More poems. May the Blessings of Christ Jesus shower His riches in grace, healing, comfort, and love over you and yours!